"Honestly, there are not a lot of things you can do to manage temperatures in the lower Columbia River," Graves said. Northwest fisheries managers must respond faster to reduce fish kills of sockeye salmon in the Columbia River Basin if warm-water conditions return, a draft report taking a hard look at last summer's massive die-off says. The National Oceanic and Atmospheric Administration report released late last month describes conditions and assesses actions of fisheries managers in a year when 90 percent of the 510,000 sockeye salmon that entered the Columbia died. Endangered Snake River sockeye perished at an even greater rate, with only about 1 percent of the estimated 4,000 fish returning from the Pacific Ocean surviving the 900-mile journey to central Idaho. "We need to be faster," NOAA's Ritchie Graves said. "There was too much talking and not enough action and experimentation." In 2015, a rare combination of an extended heat wave coincided with low flows in rivers to push water temperatures above 70 degrees, conditions that had not occurred in the basin since at least the 1950s and can be lethal for cold-water sockeye. "Should similar events occur frequently, the impact on sockeye salmon populations in the Columbia River basin could be substantial," the report says. The draft report lists nine actions fisheries managers could do to recognize earlier when a massive die-off is looming and some actions to potentially reduce the die-off. Among the recommendations is making changes to get real-time reporting of temperatures in fish ladders at dams to provide an early warning. Graves said he'd be surprised if that change isn't accomplished in the next two years. The report also said drawing cold water from deep in reservoirs to use in fish ladders could help keep fish moving upstream. That was a problem last year when warm water in some fish ladders caused migrating salmon to stall. The report says that in 2016 a new, permanent intake structure at Lower Granite Dam will draw water from 60 feet deep and give managers a greater ability to keep water cool. Much of the report deals with the Snake River where managers have more ability to control water temperature by releasing cold water from Dworshak Dam. The report notes that last year faulty temperature readings caused managers to reduce cold-water releases from Dworshak Dam just when Snake River sockeye needed it most. The mistake went unnoticed for about a week, and by then managers were moving forward with the capture and transport of Snake River sockeye to a fish hatchery. But managers say 90 percent of Snake River sockeye died before even reaching the Snake River. "It definitely didn't help, but I don't think it was a significant factor in the loss," said Russ Kiefer of the Idaho Department of Fish and Game. The report notes that one of the quandaries facing managers is the downstream transporting by barge of juvenile Snake River sockeye. In 2015, the report said, transported fish with poorer homing skills spent more time in the river. That proved lethal, and none of the returning adults survived the journey upstream to Lower Granite Dam on the Snake River. However, barging juvenile fish downstream is intended to boost the number of returning adult Snake River sockeye, an endeavor fisheries managers say they are now having to reconsider. 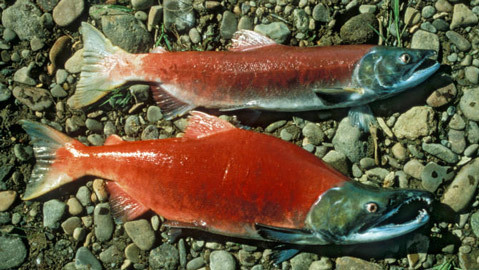 The 58-page report is being reviewed by federal and state managers as well as tribes, with comments from those entities being incorporated into a final report expected early this summer ahead of this year's sockeye run. A federal judge in Portland, Oregon, ruled on Thursday that the U.S. government doesn't do enough to improve Northwest salmon runs. U.S. District Judge Michael H. Simon rejected the feds' latest plan for offsetting the damage that four dams on the Snake River pose to salmon, saying it violates the Endangered Species Act and the National Environmental Policy Act. Simon gave the federal government until March 2018 to come up with a new salmon protection plan. The ruling was considered a victory for conservationists, anglers and others who hope to see the four lower Snake River dams breached to make way for fish. In his 149-page opinion, Simon found that for the past 20 years, the agencies have focused on trying to revive the basin's 13 endangered and threatened salmon and steelhead runs by restoring habitat without compromising the generation of electricity. "These efforts have already cost billions of dollars, yet they are failing," he wrote. Many biologists say breaching the dams is a crucial step for bringing back populations of salmon and steelhead that were decimated when the dams blocked upriver passage to their breeding grounds. Allowing the water to flow freely would also reduce its temperature, especially important in the face of global warming.